The substantial size and quality of the South Sea Pearl Necklace lends it hand to the overall features and combinations of excellent craftsmanship in growth, harvesting and the selection of the premier pearls. 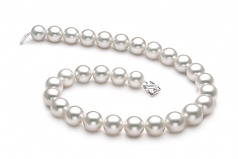 The careful selection and combining of shapes and lusters denotes the overall craftsmanship, quality and value of the finished White 14-17mm South Sea Pearl Necklace. The impeccable shape and high quality mirror image luster of this South Sea Pearl Set is graceful and classic in any formal setting. Your attire and accessories will be remembered long after your departure. Staying with quality craftsmanship, each pearl is hand strung on a fine double knotted silk thread, as the pearls are separated with a hand tied double knot to ensure that no two pearls can rub, touch or damage the shape or luster of each other. 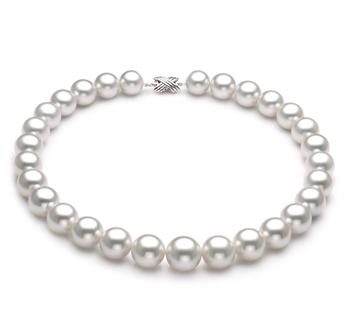 These pearls will last for generations, creating memories and attending formal events where heads will turn and envy will ensue.